The Java concurrency API provides a synchronization utility that allows the interchange of data between two concurrent tasks. In more detail, the Exchanger class allows the definition of a synchronization point between two threads. When the two threads arrive to this point, they interchange a data structure so the data structure of the first thread goes to the second one and the data structure of the second thread goes to the first one. This class may be very useful in a situation similar to the producer-consumer problem. This is a classic concurrent problem where you have a common buffer of data, one or more producers of data, and one or more consumers of data. As the Exchanger class only synchronizes two threads, you can use it if you have a producer-consumer problem with one producer and one consumer. When both threads have called the exchange() method, the Exchanger object actually exchanges the data shared by the threads with each other. This class is useful when two threads need to synchronize between them and continuously exchange data. Exchangers may be useful in applications such as genetic algorithms and pipeline designs. Let's have a look an example of Exchange class. 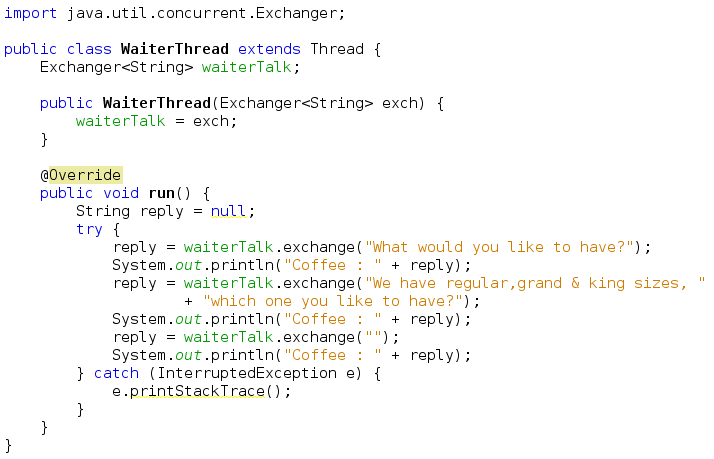 In this example we simulate talk between coffeeThread and WaiterThread. These two thread run independently. However, for a chat to happen, they need to listen when other is talking. An Exchanger object provides a means for them to talk to each other. waiter : What would you like to have? waiter : We have regular,grand & king sizes, which one you like to have? These comments explain how the program works. The main concept to be understand with this example is that Exchanger helps coordinate exchanging message between 2 threads. 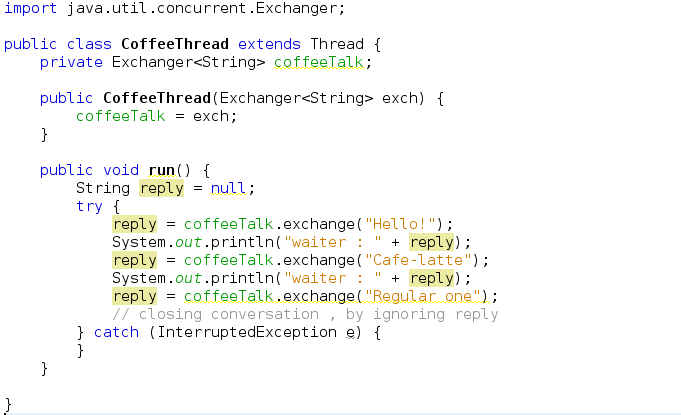 Both the threads wait for each other and use the exchange method to exchange messages.